The Melancholy of Suzumiya Haruhi Wallpaper: Select? 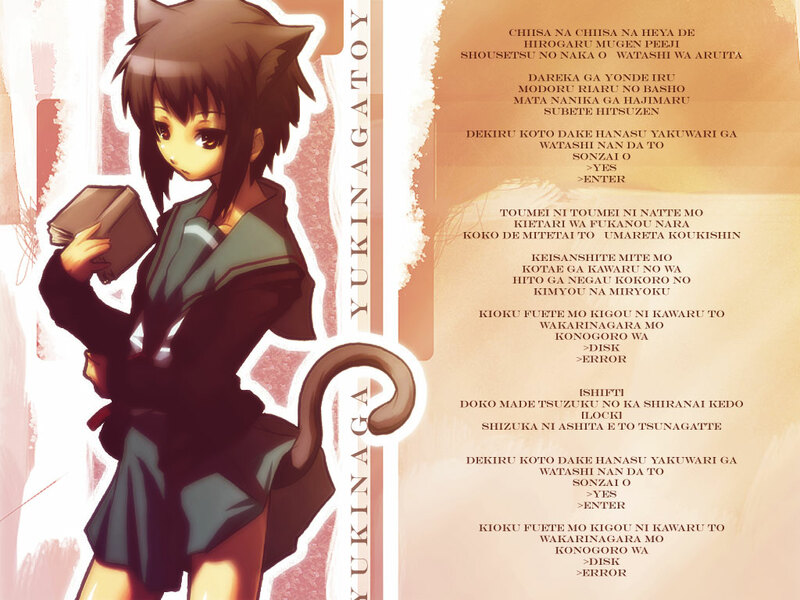 Minitokyo »	The Melancholy of Suzumiya Haruhi Wallpapers » The Melancholy of Suzumiya Haruhi Wallpaper: Select? This was originally made for a wall contest on Janime, but I didn't make it in time. To save it going to waste, I thought I'd upload it here. The character is Yuki Nagato from the series 'The Melancholy of Haruhi Suzumiya', this should be obvious, but for those who don't know, there you go. As far as I'm aware, the lyrics are from Yuki's character song 'Select? ', hence the name, if this is wrong feel free to correct me. The preview looks awful, the full view is much better, trust me. Its a very well made picture but I don't see the link to the anime. Well done and i hope to see more from you in the future! i've never seen yuki like this..